As is the practice of the Archdiocese, items from closed churches may be acquired by other parishes. Last month a parishioner notified Fr. Chateau that St. Louis the King Church had a mosaic icon of Our Mother of Perpetual Help. The Archdiocese was contacted requesting this mosaic on behalf of the parish. We were able to receive and have it delivered to us. A master craftsman and carpenter – Al Majewski, really an artist to be truthful – came out to the parish to determine if he was interested in the installation project. Gratefully, he was. The results of these efforts is our beautiful Our Mother of Perpetual Help Niche at Our Lady of Fatima Church. Next time you are at Our Lady of Fatima Church take time to see the mosaic icon of the patroness of our parish and perhaps offer a prayer for our parish, your fellow parishioners and your loved ones. The Our Mother of Perpetual Help mosaic is located in the niche near the musicians in the northeast corner of the church. We are grateful that this beautiful piece of religious art—a part of the history of the Archdiocese of Detroit—has become part of our history and found a loving home in our parish. An icon is not simply an artistic representation. In prayer it becomes a window to heaven, a point of contact, so that in praying before it, one is in the spiritual presence of the person represented. Mary’s Crown was placed on the icon by order of the Vatican in 1867 (as well as the child Jesus’ crown); it is the symbol of the many miracles performed. The star in the center of Mary’s veil is indicative that she is the “Star of the Sea” who bore the light of Christ into our darkened world. 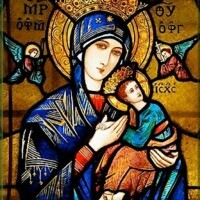 The primary initials on either side of Mary’s Crown are the Greek initials for “Mother of God”. The angel on the left, St. Michael, has the Greek initials above of St. Michael the Archangel. St. Michael, is depicted as holding the lance and gall-sop, foreshadowing Christ’s Passion and death. Mary’s blue garment is the color worn by mothers in Palestine, symbolic that Mary is both Virgin and Mother. Mary’s eyes are large to see our troubles and needs; they are always turned toward us. The entire gold background is a symbol of Heaven, where Jesus and Mary are now enthroned. The angel on the right is St. Gabriel the Archangel. Above the angel are the Greek initials of St. Gabriel the Archangel. St. Gabriel, holds the cross and the nails, foreshadowing of Christ’s Passion and death. The initials to the right of Jesus’ head are the Greek initials for Jesus Christ. Mary’s hands hold the child Jesus lovingly, because she is his Mother. Her hand does not clutch the hands of Jesus tightly, but remains open, inviting us to her son, Jesus. Jesus’ hands are turned downward, a symbol of His placing the Graces of Redemption in her hands. These Graces are available to any and to all who ask her for them through prayer. Jesus’ sandal falling from his foot is indicative of the haste with which he has to run to her in fear, gazing at the angels who hold the instruments of His Passion and death. The loose sandal also represents Christ’s Divine nature, untied from the bounds of earth. The sandal that remains secure is symbolic of His human nature.